Darjeeling 'Queen of Hills' is the name of a town as well as a district in West Bengal state of India. Both the town and the district is famous as one of the most important tourist destinations in the country. Darjeeling is famous throughout the world for the tea it grows and the great view of Kanchenjunga range of mountains that it offers. It is also known for its richness in cultural & natural heritage and the famous toy train that has been declared an UN heritage. The district covering about 1144 sq km, attracts millions of tourists every year for the variety of attractions it offers. Or Afternoon : Padmaja Naidu Himalayan Zoological Park (closed on thursday), Himalayan Mountaineering Institute, Japanese temple, Darjeeling Tea State, Ropeway, Joy Train Ride, Ava Art Gallery, Tibet Museum Darjeeling (closed on sunday) etc. Morning : Pick up at around 4.30 and transfer to view sunrise at tiger hill, batasia loop and ghoom monastery on the way. Afternoon : Padmaja Naidu Himalayan Zoological Park (closed on thursday), Himalayan Mountaineering Institute, Japanese temple, Darjeeling Tea State, Ropeway, Joy Train Ride, Ava Art Gallery, Tibet Museum Darjeeling (closed on sunday) etc. Afternoon : Padmaja Naidu Himalayan Zoological Park (closed on thursday), Himalayan Mountaineering Institute, Japanese temple, Darjeeling Tea State, Ropeway, Joy Train Ride, Ava Art Gallery, Tibet Museum Darjeeling (closed on sunday), Rock Garden etc. 1. Tiger Hills Darjeeling : Tiger Hill is located in Darjeeling, in the Indian State of West Bengal, and is the summit of Ghoom, the highest railway station in the Darjeeling Himalayan Railway – a UNESCO World Heritage Site. It is famous for its panoramic view of Mount Everest and Mt. Kangchenjunga together. It is 11 km from the town of Darjeeling and can be reached either by jeep or by foot through Chowrasta. 2. Ghoom Monastery Darjeeling : Yiga Choeling Monastery of Ghoom is one of the oldest Tibetan Buddhist monasteries in Darjeeling area built in the year 1850. This is the original or the old Ghoom Monastery. There is another monastery called Samten Choling Monastery in Ghoom which is also sometimes referred as Ghoom Monastery by the local drivers. So if you are planning to visit the original Ghoom Monastery, be specific and mention old Ghoom Monastery. 3. Batasia Loop Darjeeling : If you are taking a toy train joy ride from Darjeeling, you will pass by this magnificent loop. Otherwise, take a cab from Darjeeling town and visit the Batasia Loop. It's located on Hill Cart Road that goes all the way to Siliguri. There is no better place to get a 360 degree view of Darjeeling's landscape including the hill town and the snow covered peaks of the Eastern Himalayas with the majestic Kanchenjunga on one side. 4. Darjeeling Himalayan Railway : The Darjeeling Himalayan Railway is the first, and still the most outstanding example of a hill passenger Railway. Open in 1881, it applied bold and ingenious engineering solutions to the problem of establishing and effect rail link across a mountainous terrain of great beauty. It is still fully operational and retains most of its original features intact. 5. Padmaja Naidu Zoological Park : Padmaja Naidu Himalayan Zoological Park is a 67.56-acre zoo in the town of Darjeeling in the Indian state of West Bengal. The zoo was opened in 1958, and an average elevation of 7,000 feet is the largest high altitude zoo in India. It specializes in breeding animals adapted to alpine conditions, and has successful captive breeding programs for the Snow leopard. 6. Japnese Temple Darjeeling : There is a wonderful Japanese temple located at a 10 minutes driving distance from the Darjeeling town. The temple is also known as the Nipponzan Myohoji Buddhist Temple. The two storied white building was built in a traditional Japanese style in the year 1972. Close to the temple is the Peace Pagoda that showcases four avatars of Lord Buddha. 7. Ropeway Darjeeling : One of the best ways to experience the panoramic views that Darjeeling is by taking a ride on the ropeway. It's also called the Rangeet Valley Cable Car because of the spectacular view of the valley around the river Little Rangeet. 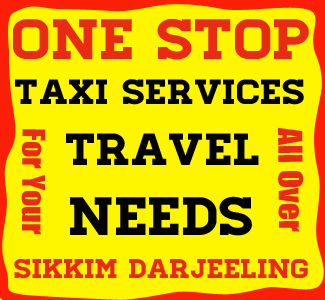 You will need to board the cable car from Singamari which is some 3km away from Darjeeling Chowk Bazaar. 8. Darjeeling Tea State : Darjeeling tea is a tea from the Darjeeling district in West Bengal, India. It is available in black, green, white and oolong. When properly brewed, it yields a thin-bodied, light-coloured infusion with a floral aroma. The flavour can include a tinge of astringent tannic characteristics, and a musky spiciness sometimes described as "muscatel". 9. 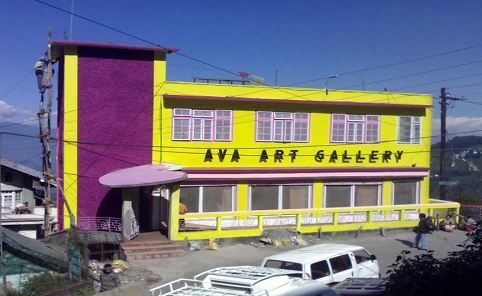 Ava Art Gallery : You can't miss this bright purple and yellow colored two storied building on the left as you drive along the main highway or the Hill Cart Road towards Darjeeling town center. At the outskirts of the town and 4km (i.e. some 2.5 miles) away, Ava Art Gallery was jointly established in 1965 by Late Ava Devi who was known as a genius of embroidery art, and Bhopal Rao Sett. 10. Tibet Museum Darjeeling : This is the newest museum in Darjeeling inaugurated on 2nd July 2015 by revered Tibetan guru Gurung Tulku Nima Hoiser Rinpoche. The timing was so chosen to coincide with the 80th birthday celebration of Dalai Lama. The museum is located on Gandhi road and within easy walking distance from the town center (i.e. the clock tower area). 11. Rock Garden Darjeeling : The Rock Garden at Chunnu Summer Falls and Ganga Maya Park are tourist attractions points in Darjeeling. It is a showpiece meant to lure people to Darjeeling after political agitations disrupted tourism in the 1980s. There is another rock garden in Darjeeling known as Sir John Anderson Rock Garden, which is part of Lloyd's Botanical Garden. Places to visit near Darjeeling. Airpot : Bagdogra (85 kms from Darjeeling) is the major airport of the region. Regular flights connects Bagdogra to major airports in the country. Rail Station : NJP (New Jalpaiguri) 82 kms from Darjeeling is the major Rail Station. Road : Siliguri 75 km from Darjeeling is the main junction and the largest town nearby the state. Indian & Foreigners: Indian & Foreigners tourists visiting Darjeeling do not require any permit to enter the state. Best time to visit darjeeling is during the months of March, April, May, June, October, Nov. Most of the roads remains closed during the month of July, August due to heavy rainfall and landslides. Also some of the tourists don't prefer to visit Darjeeling in the months of December, January and Febrary due to cold climates.